While each yoga practice requires specific features, most of them necessitate a large, open central space alongside a set of support rooms. This room should be able to accommodate multiple people by featuring a flexible, free plan that can be adapted to varying uses. The open space also comes in handy when releasing negative energy as opposed to practicing in a tiny, squeezed room. It should also provide an unrestricted view of the teacher by the students. The architect should avoid creating oddly-shaped spaces with nooks and crannies; hidden spaces might obstruct the instructor’s view. Ideally, the yoga studio should feature a dedicated wall space for posture assistance, particularly during inversions. For this purpose, the constructor should use wood or paint the walls rather than decorating them in a way that prevents posture aid. Lighting is an important aspect when qualifying a yoga studio space; it can significantly influence the quality of one’s session. However, a person shouldn’t settle on any lighting. When setting up a yoga studio, one should use illumination that sets a relaxing tone. In other words, they should employ ambient lighting as an alternative to overly bright lights. This is because the studio should help students achieve a serene environment that will sufficiently calm their mind. The softer the illumination, the more relaxed the learners will be. If possible, illumination should be done using natural light. Reason being; natural light has a number of unique benefits that include aiding in concentration and enhancing a good mood. But if natural light is not ideal for the clients due to privacy concerns, one can use illumination that mimics natural radiance such as LED lights or fluorescent bulbs. Ventilation easily tops the list of the primary concerns when designing yoga studios. This is because most of the practices require inhaling fresh air for enhanced spiritual development. By ventilating the room sufficiently, the user is guaranteed of uninterrupted oxygen renewal during sessions including when the room is unoccupied. Without proper ventilation, one is likely to find students struggling to breathe or even suffering a stroke due to lack of sufficient oxygen. For more information and advice on ventilation for yoga studio, check out what the expert designers have to say. There are possibly no rules hindering one from experimenting with numerous, vibrant colors. However, people should remember that the main purpose of yoga is finding inner peace, something that can hardly be achieved in a studio riddled with bright colors. Instead of choosing bright hues like orange and red, one should go for soothing colors like blue and grey. More importantly, the color scheme should be consistent throughout the studio. Although there are beliefs that a yoga studio should be completely silent, its disciplines can be effectively developed even in the presence of ambient noise. Ideally, optimal results are obtained when individuals perform yoga classes outside. This is because the sounds of nature from the surroundings facilitate better realization in different practices. When it comes to designing yoga studios, such sounds, or even smells can be obtained by incorporating indoor gardens or courtyards to attract birds. One can also incorporate the sound of moving water or flowing wind to give the room a natural feel. For individuals who specifically require complete quietness, the studio should include a special, isolated room that keeps disruptive sounds away. The ceiling height should be a prime consideration when designing a yoga studio. Ideally, the ceiling height for an optimal yoga environment should be about eight feet, which is capable of accommodating a six-foot individual with their arms raised above heads. This is especially beneficial when performing poses like the tree pose. The idea behind creating higher ceilings is to achieve a sense of airiness, which is essential when looking to derive optimal benefits from yoga. There is more to designing a yoga studio than choosing the color schemes and décor. A lot of architectural skills are required to develop a functional and aesthetically appealing yoga space. For instance, most architects recommend the use of hardwood or laminate for the floors to create a warm environment. This is as opposed to utilizing materials like linoleum, concrete or vinyl. 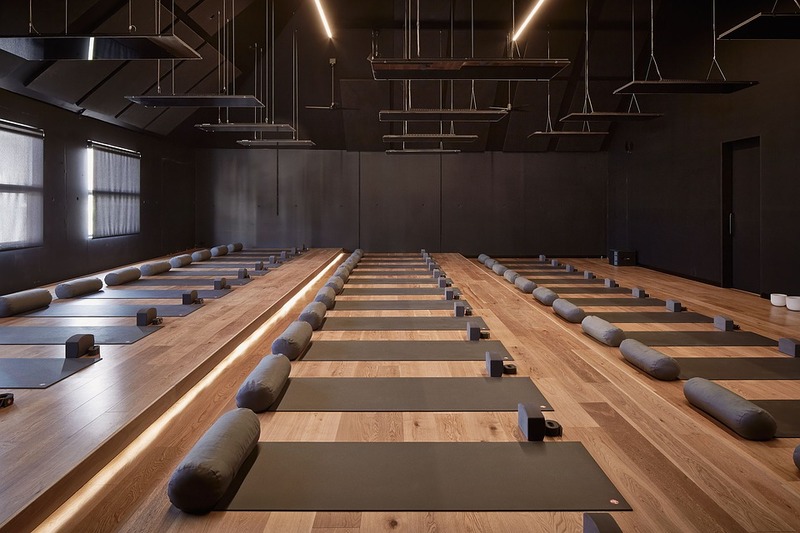 Ideally, an architect should consider such factors as lighting, noise levels, wall space and flooring comfort to mention a few when designing a yoga studio. When installing a particular feature, the architect should consider whether the design will enhance or hinder the effects of yoga on the students.